Home » Piper William Macdonald. The Highlanders of Scotland. WILLIAM MACDONALD. H.R.H. The Prince of Wales Piper. Dressed in the tartan of the Duke of Rothesay, one of H.R.H.`s titles. William Macdonald, the youngest son, was two years in Badenoch, in the employment of Mr. Macpherson, of Glen Traim, as gamekeeper, and afterwards two and a half years with John Fisher, Esq., tenant of the Shooting of Colonel Macpherson, of Belleville, also Badenoch. 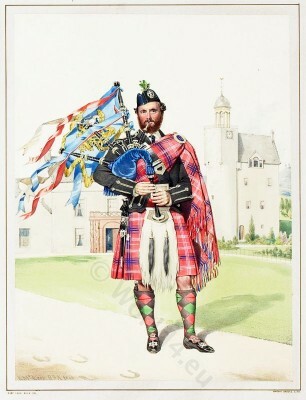 William Macdonald was appointed Piper to His Royal Highness the Prince of Wales in 1865. He is a very unassuming man, and a good servant. His ancestors followed Glengarry, as their Chief. William MacDonald, painted at Abergeldie in 1866 for Queen Victoria by Kenneth MacLeay. Source: PORTRAITS ILLUSTRATIVE OF THE PRINZIPAL CLANS AND FOLLOWINGS AND THE RETAINERS OF THE ROYAL HOUSEHOLD AT BALMORAL, IN THE REIGN OF HER MAJESTY QUEEN VICTORIA, BY KENNETH MACLEAY, ESQ., R.S.A. With topious Notices from Authentic Sources. In colored Lithographs by Vincent Brooks. London: Mr. Mitchel, Publisher to her Majsty, 33, Old Bond Street, W. Edinburgh: Blackwood and Sons. 1870. 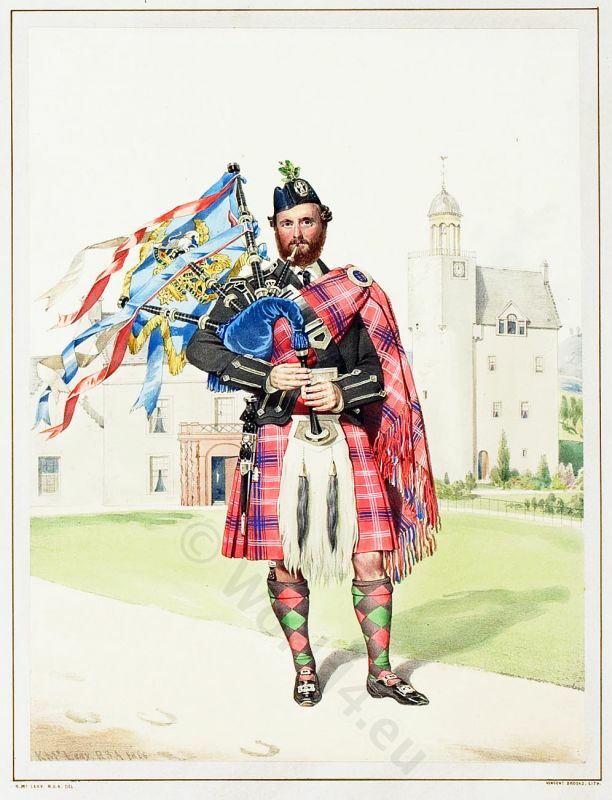 This entry was posted in 1870, 19th Century, Scotland, Traditional and tagged Tartan, Traditional Scottish National Costume on 3/19/13 by world4.